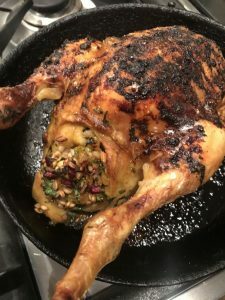 I love ‘one pot meals’, not only it saves on the washing up; thus prevents husband from moaning, but also it’s so much easier to chuck everything into one dish and slam it in the oven. Hey presto a little later you have a really tasty meal. 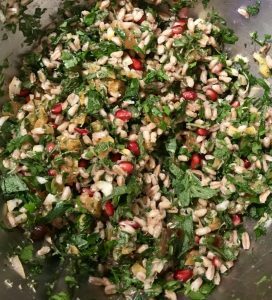 Farro is a whole grain a bit like barley or spelt and has a wonderfully slightly nutty taste and is delicious in salads, risottos and soups. You could use pearly barley or giant cous cous for this recipe if you prefer…or quinoa for gluten free. 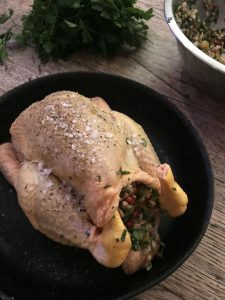 The recipe below is for 4 people, but if you want to make it for 2 you can always use a poussin instead (reduce the cooking down to about 25 minutes). Place the cooked farro in a bowl and add the remaining ingredients ( reserving 1 tbsp of pomegranate seeds for later) except the chicken and pomegranate molasses. Season with salt and pepper. Stuff the chicken with the farro mixture, cramming as much stuffing into the cavity as you can. Any left over you can keep till later. 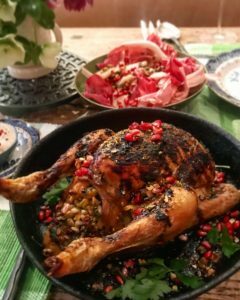 Place the chicken on a roasting tray and season with salt and pepper and drizzle over 1 tbsp of olive oil and about a 1tbsp of pomegranate molasses. 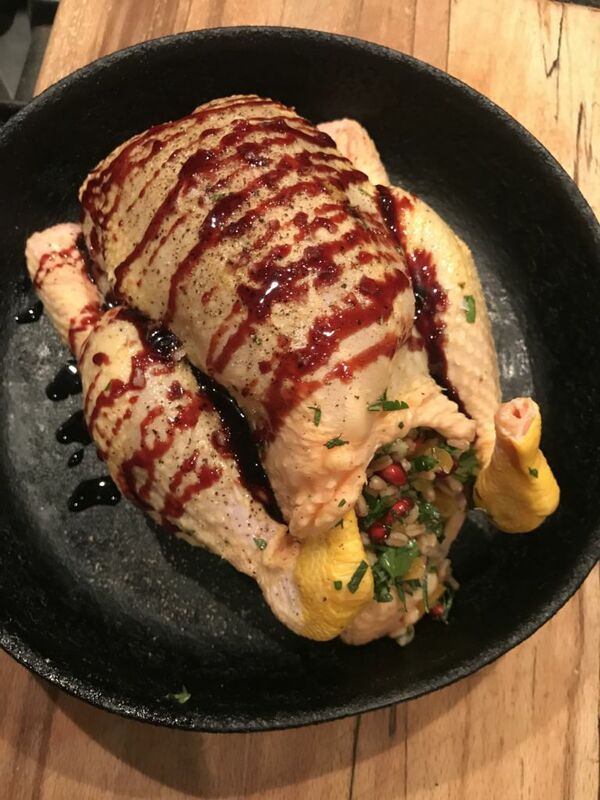 Cook for 45-55 minutes until the juices run clear. Remove from the oven and loosely cover with foil and leave to rest for 15 minutes. 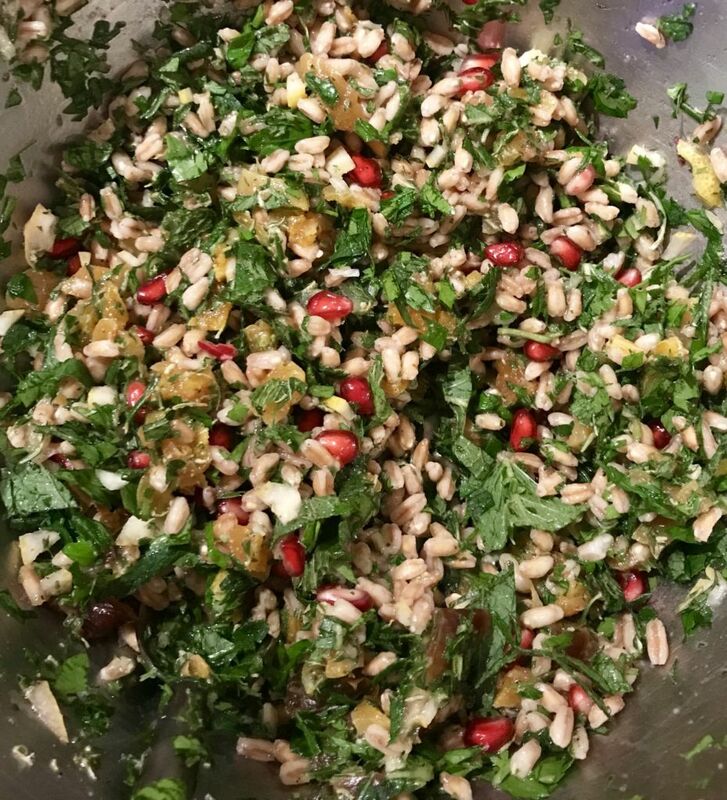 To serve sprinkle over the remaining pomegranate seeds and serve with tahini dressing and a crisp salad. Mix all the ingredients together adding a little more water if necessary. The consistency should be like thick cream.